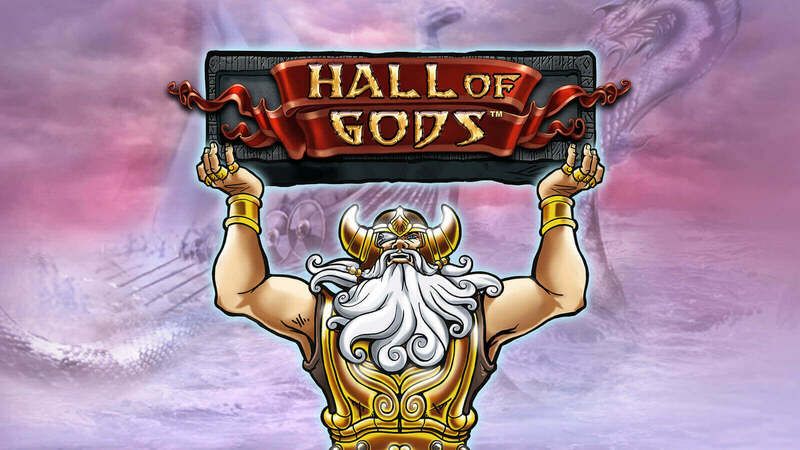 Hall of Gods is an online slot game with an immersive theme centred on Norse mythology. The game was developed by Net Entertainment and is a five reel online slot with twenty selectable pay lines. Each pay line has five betting levels with coin sizes ranging as little as 0.01 up to 0.50. The online slot game features three progressive jackpots. The mini, midi and mega jackpot amounts are visible above the reels while below the reels sit the main function buttons. There is an auto play button which allows anything from 10 to 1 000 spins to be set to spin automatically and a max bet button to automatically have the highest bet placed the reels spin. Apart from the intricate artwork of Norse Mythology enhancing the themed graphics with features such as knots and scrolls, the background sound effects also enhance the theme. Suspenseful drum beats are heard throughout the game and winning combinations produce excitable tunes when they land on the reels. When the scatter symbols appear at least three times anywhere on the Hall of Gods reels the free spins bonus round feature is triggered. The number of free spins is determined by the number of scatters appearing. Three, four or five scatter symbols award ten, fifteen or twenty free spins. While the free spins are in play all winning combinations landing pay out three times the regular value and if three or more of the scatter symbols appear again in any position on the reels, the free spins bonus round feature is re-triggered. The higher values symbols found on the Hall of Gods reels follow the Norse mythology theme and feature some of the greatest gods like Odin; Thor; Freya; Loki and Idun. Other symbols include an axe; a chest of apples; a necklace and an ornate ring. The wild symbol displays a serpent which rises out the water and screeches while covering the entire corresponding reel when it appears on the second, third and fourth reels. Apart from being an expanding wild and an additional visual feature, the wild typically acts as a substitute for all regular symbols when a winning combination is possible. The two black ravens symbolize the scatter symbol which can award the Hall of Gods free spins bonus round while Thor’s hammer is the bonus symbol that activates the second screen bonus game, making this one of the most exciting online slots Canada and other regions have to offer online to players today. Three or more of the bonus symbols landing in any position on the reels will activate the Hall of Gods bonus game. A second screen displaying a number of shields will be shown. The aim here is to use Thor’s hammer to break as many shields as possible to reveal the hidden prizes underneath them but there must be three matching prizes revealed in order to be awarded what they are worth. The icons that award any of the mini, midi and mega progressive jackpot amounts may be hidden under the shields and revealing three of them will award the amount shown above the reels.